Made famous by the popular film, The Sound of Music, the von Trapp family's real life history has some significant differences from the story portrayed in the film. If you're related to this notable family or are simply curious about the genealogy of the clan, it helps to understand which parts are truth and which are fiction, as well as a bit about the origin of this noble name. There are a number of important differences between the real von Trapps and the family in the 1965 musical. The real life von Trapps fled Austria to avoid the Nazis, but they didn't cross the Alps. They boarded a train, claiming to be going on a family vacation. None of the von Trapp children's names were used in the movie. There were 10 children in real life, seven of whom can from Georg von Trapp's first marriage and three of whom were from his second marriage to Maria. Georg and Maria von Trapp were not married in 1938 as the film indicates. Their real life wedding took place in 1927. Von Trapp is an Austrian name, which is actually made up of two parts. According to YourDictionary, the prefix, "von," means "of" or "from." In some cases, it can also denote someone of noble lineage. The "Trapp" portion of the name means trickster or rogue, according to House of Names. Ancestry reports that it can also mean steppes, as in stair-like hills. The Trapps were a highly influential Austrian noble family, and the first use of the name dates back to 1388. During this time, people were just beginning to use surnames to differentiate themselves from one another, so names with meanings like this can be very telling about the personality of ancient ancestors. While the singing von Trapps are the most famous members of this family, there are actually several versions of this name. As you research the family history, you may notice that records are spelled in various ways. It's also important to note that you may be related to people who share similar names, as names were regularly changed during immigration. House of Names reports that Stephen Trapp was likely the first member of this family to immigrate to the United States. He settled in Virginia in 1657 and was followed by many other Trapps and von Trapps in coming decades. The pace of immigration increased in the 19th century. During the first half of the 20th century, there were many Trapps and von Trapps fleeing Austria. As a result of World War I, Austria became a small independent nation in 1918, but it did not have a solid place among the long-established countries in Europe. This tumultuous time caused some Austrians, including members of the Trapp family, to emigrate to the United States and Canada. When the country fell to the Nazis, in 1938, others, like the famous von Trapps, left in the hope of a new life. Some real von Trapps from the film, including Maria, filed for U.S. citizenship in 1944. However, most of the famous family had been in the U.S. for several years prior due to their jobs as traveling singers. There's a wealth of information on genealogy websites about the von Trapp family, but because of their fame, there are some specific resources you can access to learn more about them. National Archives - The U.S. National Archives at Boston has a very helpful collection of immigration information about the von Trapp family, including documents you can view online. 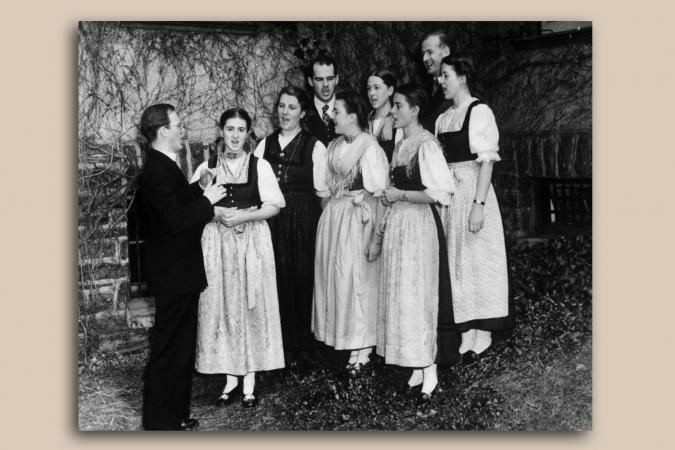 The Story of the Trapp Family Singers - Written by Maria von Trapp, this is the moving story of the family's history and immigration, including information about their successful singing career. The World of the Trapp Family - Author William Anderson excels at making famous families accessible and is a noted biographer of historical figures like Laura Ingalls Wilder. His 168-page biography of the von Trapp family covers their lineage, the flight from Austria, and their lives in the United States. Whether you're interested in the famous von Trapps or are related to a branch of this illustrious family, it's fun to learn a bit more about the von Trapp ancestry. Knowing the background for the family can make your genealogy research much more dimensional and interesting, adding personality to the names and dates you may have already discovered.